Andy Awford is refusing to look ahead. But there’s only one sight on the horizon for Pompey fans: The top seven. It may still be a distance off but a path which just a couple of weeks ago looked completely blocked has become, partially, cleared. The miserable run through December and January meant the single debate among supporters was whether their manager should remain. That has now been replaced by resurfacing talk of whether their team really can make the play-offs. It’s still a distant ambition and, for all the thrill of the Cambridge’s Abbey Stadium annihilation, the gap remained the same at 4.50pm as it did at the start of the afternoon. Tuesday’s win not only closed the gap to nine, but, the manner in which it came about provided a further shot in the arm to the team’s belief, which is now at a season’s high. Fourteen points from a possible 18 since the final day of January has undoubtedly invigorated spirits and, indeed, ambitions. Are they realistic, however? Or is this just a desire to create a narrative for the remainder of a season when there isn’t one? Delving into the past is always a sound way to gain an insight into what lies ahead. And that tells us it’s still a stretch for Pompey’s recent title-winning form to be enough to extend their season beyond May 2. It is a general truism in the Football League a team will come up on the rails and make a late bid for success. York last season are heralded as the trailblazers for Awford’s side; the evidence a team can come from the depths of League Two to reach the play-offs. What the Minstermen achieved, though, was pretty special. After 32 games, Nigel Worthington’s men had accrued 39 points but they were three fixtures into an incredible run which produced 11 wins and six draws from their final 17 fixtures. Historically, in League Two, it will take around 70 points to finish inside the top seven, although there are variations in that landmark. York (2013-14, 71 points), Bradford (2012-13, 69 points), Crewe (2011-12, 72 points), Torquay (2010-11, 68 points) and Notts County (2009-10, 72 points) are totals for teams finishing in that position in recent seasons. Pompey, of course, are in the midst of their finest run of the campaign. Six games have harvested 14 points from a possible 18. February, however, was always pinpointed as an easier run of fixtures. It was certainly highlighted when discussions over Awford’s future was taking place. Even so, the side have superseded any reasonable expectations for the period. What, quite simply, is needed is for the form to continue at virtually the same rate to make the play-offs. Awford’s side have averaged an outstanding 2.3 points a game since the draw at Wycombe. Continuing that will do the job without doubt. But, then, maintaining that form for a season would have seen 106 points collected! 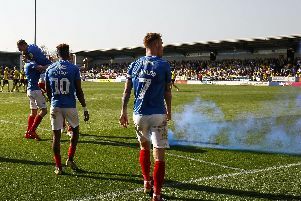 What will help Pompey’s cause is to slow the rivals at the top – something they have emphatically failed to do. In 12 attempts, they have failed to beat any of the top eight and picked up just four points. What unfolds in the four games against sides occupying those positions will be critical. The Great Escape in 2006 will go down as one of Pompey’s finest achievements. Six wins and two draws from nine games kept the Blues in the Premier League against all odds. What we’re looking for now is that form over an extended period – The Great Escape x 2, if you like. That would be some play-off push.